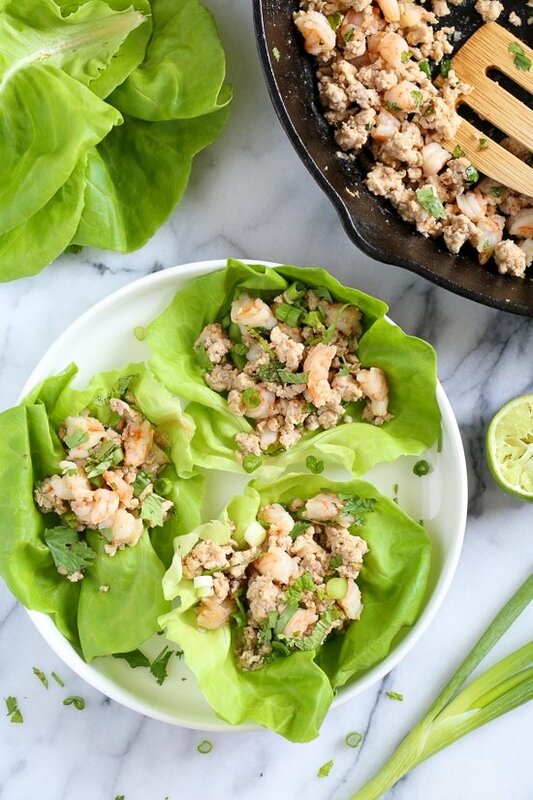 This chicken and shrimp laap or larp is a Laotian version of lettuce wraps. It’s low-carb, Paleo-friendly, Whole 30 approved, loaded with flavor and so fast and easy to make! 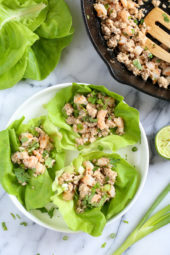 Laap (also known as Larb) is regarded as the “unofficial” national dish of Laos. It’s made with many different minced meats including duck, pork, turkey but I really love this combination of chicken and shrimp. Switching lettuce for bread is a great way to turn any sandwich or taco into a low-carb meal. 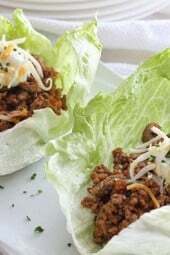 Some of my favorites are Turkey Taco Lettuce Wraps, Asian Chicken Lettuce Wraps, and even BLT Lettuce Wraps. From the cookbook Ready or Not! 150 Make-Ahead Make-Over, and Make-Now Recipes by Nom Nom Paleo, this recipe is low-carb, Paleo-friendly, Whole 30 approved, loaded with flavor and so fast and easy to make! From Michelle and Henry’s book: One of our family’s favorite dishes from Chiang Mai is laap, a Laotian minced meat salad featuring hot chili paste, toasted rice powder, bits of offal, and a shower of fresh herbs. 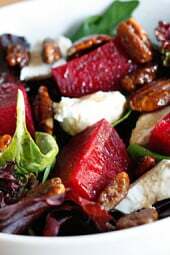 Back at home, I wanted to replicate these flavors and textures, but quickly discovered how challenging it can be to re-create laap with Paleo-friendly supermarket ingredients. But after replacing the rice powder with coconut flour and the naam phrik laap paste with spices from my pantry, I now have a family-friendly laap recipe I can make on a moment’s notice. Their book has so many recipes I can’t wait to try, and I love the fun comic book style of step by step photos included with each recipe. And this recipe, a keeper! What’s not to love about eating with your hands! On a parchment-lined baking tray, toast the coconut flour in a 300°F oven for 5 to 7 minutes or until the flour turns golden brown. (You can also toast the coconut flour in a dry pan over low heat instead.) Set aside. In the meantime, heat the oil in a large skillet over medium-high heat. Add the sliced shallot and sauté for 2 to 3 minutes or until softened. Add the ground chicken, and break it up with a spatula. Cook, stirring, for 3 to 5 minutes until no longer pink. Add the shrimp and stir-fry for another 2 to 3 minutes or until the shrimp is cooked through. Remove the pan from the heat and add the fish sauce, lime juice, toasted coconut flour, and cayenne pepper. Adjust the seasoning to taste. Sprinkle the chopped herbs on top. 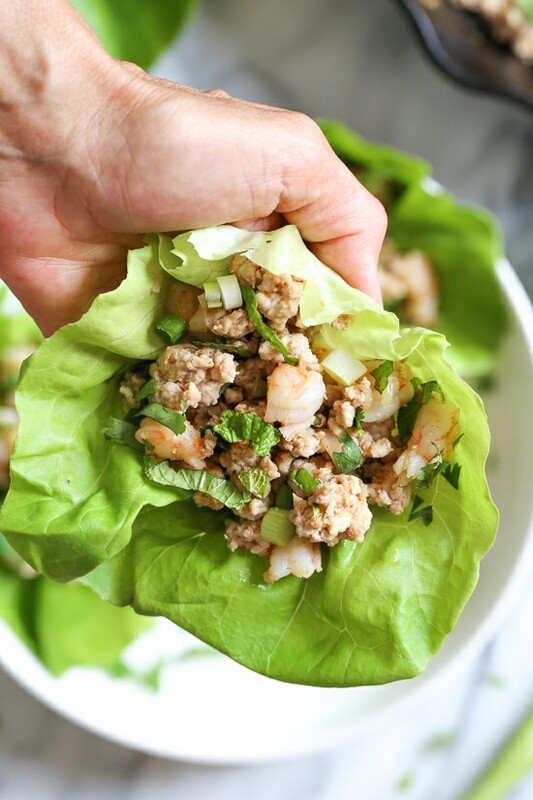 To eat, wrap a 1/3 cup of laap in a lettuce leaf and devour. Is this freezer friendly ? Wow!!! This is soooooooooo yummy!!! Love the fresh herbs on top, it takes it to the next level!!! Just made it and shared the recipe with ALL my friends! This is soooooo good! This was AMAZING! Definitely adding this to my weekly rotation. Loved all the flavors. 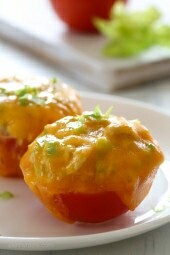 Perfect to make for lunch or a weeknight dinner. Definitely don’t leave the mint out (unless you really hate it!). It adds a different level of flavor. This meal tastes exotic, but took about 20 minutes to come together. Love it! Isn’t it great! And so easy! 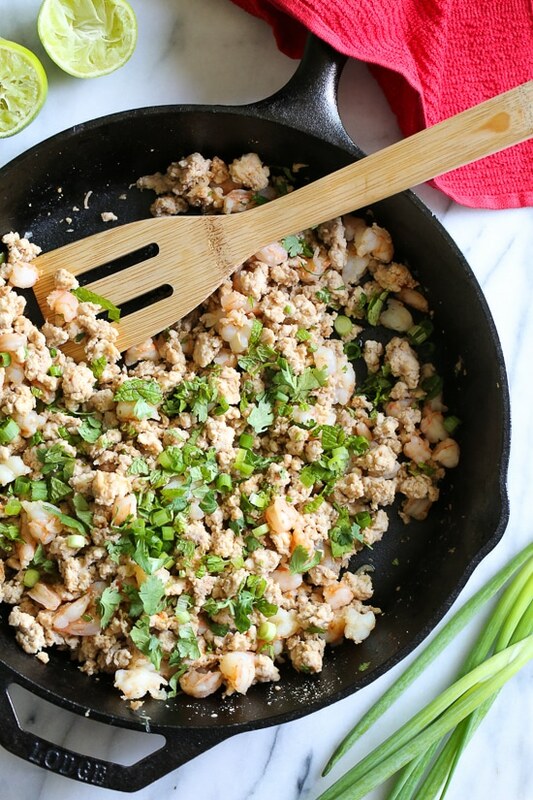 Tried this today but used ground chicken breast instead of thighs, just cause it was easier to find. It was great and so easy to make! Thank you for another wonderful recipe! I am severely allergic to shellfish. Is there something that I can substitute the shrimp with, or should I just use extra chicken? I’ve made this with just chicken and it’s worked out fine! This was delicious, and as good as the larb we order at our favorite Thai restaurant. Served it in lettuce cups, but also made your cilantro lime rice for the ravening hordes who needed some carbs (husband, kids). Perfect accompaniment to the chicken. Thanks! Hi Gina, This sounds amazing. Can I use regular flour instead? If so, how much? No, I would just omit it. Thanks Gina, I’ll try it in this in the next few days! Hi Gina, I’d love to try this but is there a substitute for coconut flour? I don’t want to buy so much of something when all you use is a teaspoon? Maybe ground coconut flakes? Thx. Love that you include so many multicultural recipes!! You can omit it, I haven’t tried with coconut flakes. I was curious what the purpose of the coconut flour is? Is it for taste or texture? Also, do you find that it makes a big difference in the result? Thanks, I love your site!! I found it at Fresh Thyme in our area.. bought a dab for ten cents!!! How exactly can I get my hands on ground chicken thighs? My grocery store butcher will grind (or chop, dice, slice, and otherwise break down) any cut of meat. I’d call around to stores in your area and see if they will as well! Otherwise, I’ve seen Perdue and Foster Farms ground chicken in the pre-packaged meat section. Wowzers, everything that I love in one easy dish! Thanks so much. I greatly enjoy your recipes, emails, book and attitude. I am trying to figure out how to print your Finger Lakes trip without the pictures (too much ink) and look forward to taking the trip ourselves. Thank you for all of your efforts! Perhaps you can copy and paste?